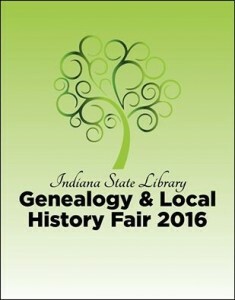 Remember your roots and celebrate Family History Month by joining us for the 2016 Indiana Genealogy and Local History Fair at the Indiana State Library! Lunch is on your own. Click here to receive your $5.00 parking voucher for the Fair. For more information, see our Events page. This blog post was written by Stephanie Asberry, Genealogy Collection Supervisor, Indiana State Library. For more information, contact the Genealogy Division at (317)232-3689 or “Ask-A-Librarian” at http://www.in.gov/library/ask.htm.